Thanks to our recently adopted hobby of geo-caching, I had the pleasure of visiting one of the most beautiful and memorable places I can think of this weekend. In fact, I had the pleasure of visitng 3 such places, but one was the clear stand out. We took the opportunity of a long weekend to run away and avoid all the things that desperately need doing at home, because quite frankly, we both needed a bit of a mental holiday, and housework, or even the reminder of it, was simply not going to do the job. So we waited until late on Thursday evening, once the worst of the crazy Easter traffic had died down and headed to Huntly to settle the cats in with their grand parents and their country holiday-home, and turned in for a good night's sleep before heading south to Rotorua on Friday morning. After a leisurely trip down, we wandered out to the Blue Lake - I love fresh-water swimming, but haven't been anywhere suitable for longer than I care to consider. I went for a refreshing (read 'bracing'!) swim while Simon headed off around the lake to find a cache, and leave his sunglasses at ground zero, and get half way back, and have to go all the way back again before returning to find me just arriving at the car as I'd given up waiting and was by now getting really really cold! But he did find the cache and managed to find his sunnies on the return trip. Happy endings on that little tale! On Saturday Simon had 2 caches planned for us to find, one in suburban Rotorua in a little area where all the roads were named after star signs. We walked through a public access way to a stream-side path and wandered along, admiring the crystal clear water and cool shade. I'm happy to say I located this cache, after decyphering the additional clue admittedly. We wandered a little further on, as several other geo-cachers before us had encouraged us to do, and were delighted to come upon a peaceful private beach and reserve, complete with jetties and kids enjoying the thermally heated waters at the lakeside. We both just stood and enjoyed the complete and utter peace of the place. We certainly would not have made it there if not for the promise of a geo-cache to locate - we're both fairly goal oriented it's fair to say! Next we headed back to the car and proceeded to drive around the lake, noting the queue of traffic heading into Rotorua as we went out and expressing relief that we weren't coming back that way! 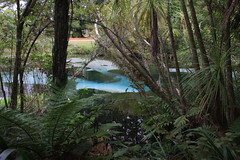 At the northern most part of the lake is the Hamurana Springs. This is a place I simply will not forget in any great hurry, and plan to return to. Soon and often. First was the beautful stream that we crossed over to get to the trail to the springs - we stood on the bridge admiring the pristinely clear water, the abundance of plump trout and the grace of the geese floating with the current. This alone was a welcome dose of tranquility, and yet it was nothing compared to what was still to come. Shortly along the trail we glimpsed the stream again and were astonished at the almost unnaturally vivid blueness of currents within the flow. The picture to the right is very true to wh at we saw. But still, I have not reached the most wonderful place. As we continued along the trail, we entered a narrow stand of Redwood trees - breath-taking in their size and in the atmosphere they created. 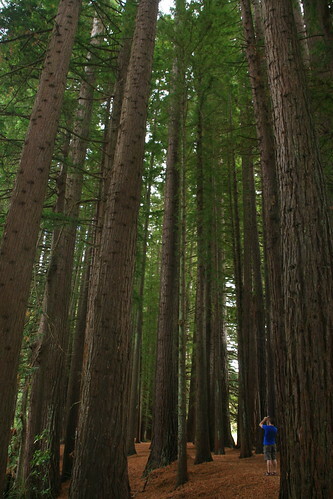 As we kept quietly ambling through (I had a strong sense of being in a place of wonder and felt as though I ought to be talking at nothing above a whisper), the narrow stand opened out into a beatiful grove of these incredibly majestic trees. The carpet of fallen leaves, the golden glow of filtered sunlight reflecting off the myriad trunks, the perfect, uncompromising straightness of their reach toward the sky all combined to make this a place I feel entirely inadequate to describe without doing it some sort of injustice of understatement. To stand and spread your arms in this place seemed the most natural thing in the world to do. To drink in the peace, the power, the energy, the pure life of this place was a wonder, an honour and a treasured joy. I could have spent a lifetime drinking it in and still have not wearied of it. I will return. For now, I will do so often in my memory, but so too I will return in body and draw from the energy and peace of this place. 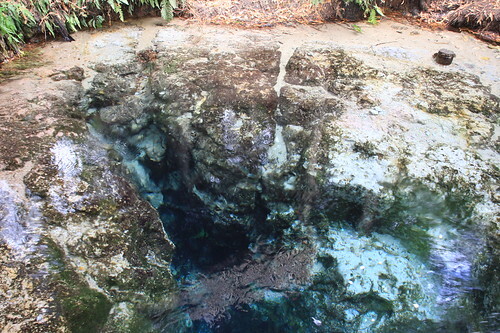 There was more to the journey, as we continued, seeking a waypoint to a geo-cache, and happening upon the source of the spring - a shaded pool with a deep deep chasm that seemed lit by that same eerie blue we had noted in the stream further down. 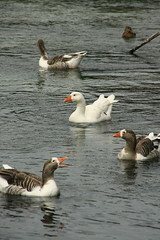 The current from the spring was so strong that even the ducks seemed to be straining to swim to the source. I'm afraid I'm out of words on this one. Hopefully I've managed to portray at least a little of this magnificent spot. More pictures in my flickr stream.